Please note that the content of this book primarily consists of articles available from Wikipedia or other free sources online. Hephaestus Books represents a new publishing paradigm, allowing disparate content sources to be curated into cohesive, relevant, and informative books. To date, this content has been curated from Wikipedia articles and images under Creative Commons licensing, although as Hephaestus Books continues to increase in scope and dimension, more licensed and public domain content is being added. We believe books such as this represent a new and exciting lexicon in the sharing of human knowledge. 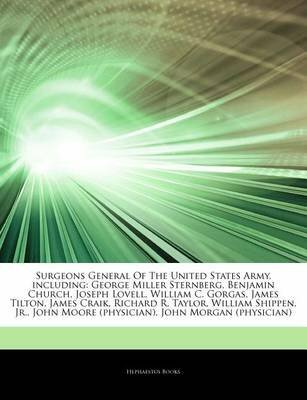 This particular book is a collaboration focused on Surgeons General of the United States Army.More info: The Surgeon General of the United States Army is the senior-most officer of the U.S. Army Medical Department (AMEDD). By policy, the Surgeon General (TSG) serves as Commanding General, U.S. Army Medical Command (MEDCOM) as well as head of the AMEDD. His (or her) office and staff are known as the Office of the Surgeon General (OTSG) and are located in Falls Church, Virginia.